This is a mirror back, made in Paris in about 1320. It depicts a scene with two pairs of lovers. 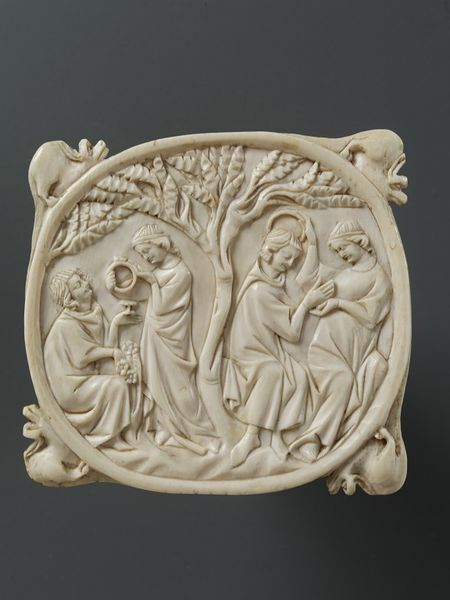 In the period between 1300 and 1325 workshops in Paris enjoyed a thriving market for secular ivory carvings. They produced mirror-cases, combs and gravoirs (hair parters), often selling them as sets in leather dressing cases. Subjects from romance literature appeared frequently. Ivory combs, together with mirror cases and gravoirs for parting the hair, formed an essential part of the trousse de toilette or étui (dressing case) of the typical wealthy lady or gentleman in the Gothic period. Gothic ivory mirror backs survive in considerable numbers. The ivory cases themselves, usually between 8 and 14 cm in diameter, consisted of two paired ivory discs (described here as ‘mirror backs’), often with four crawling monsters or lions (or leaves) carved around the outer edge. These ornamental features would transform the circle into a square and make the opening of the case easier, although their vulnerability to breakage is now all too evident. 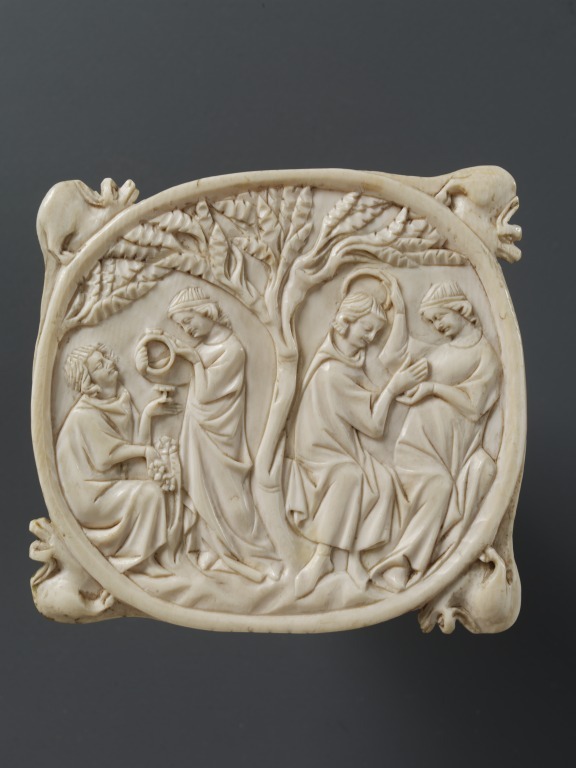 The majority of the ivory mirror cases and their leather boxes must have been purchased as expensive gifts, to be presented by the wealthy élite to their friends, family and lovers, and often as wedding presents. The subject matter of the mirror backs was almost exclusively secular. 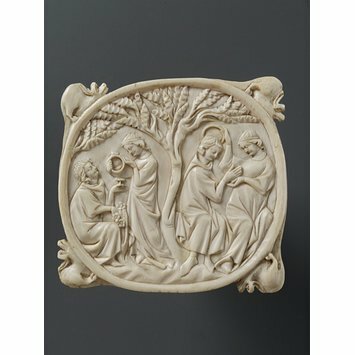 Mirror back of ivory carved with two courting scenes divided by a tree. The two scenes are separated by a tree, calling to mind the absence of the God of Love, who is frequently seen perching in the branches. On the left a kneeling young lover takes a rose from a bush and offers it to the lady, who is embellishing the chaplet in her hands. On the right a seated lady is crowning her lover. On the rim are four crawling monsters, giving the whole a rectangular form. Formerly in the Émile Gavet Collection, Paris, until 1897 (Gavet sale, Paris, 31 May-9 June 1897, no. 330). Then George Salting collection. Bequeathed to the V&A by Salting, 1910 (no. 2003).